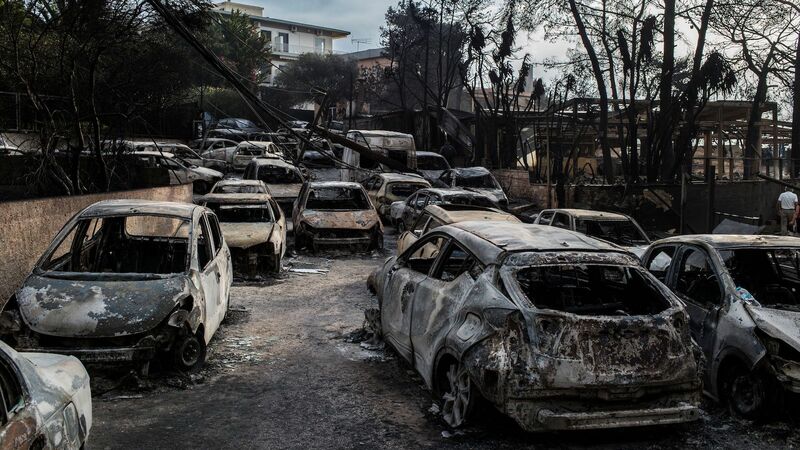 The death toll from devastating wildfires in Greece rose to 80 on Wednesday after a firestorm roared through coastal villages surrounding Athens earlier in the week. While the country's police services are investigating whether the deadliest fire near the tourist town of Mati was the result of arson, climate conditions likely also played a role in what Greek Interior Minister Panos Skourletis has called a "biblical disaster with human losses." Between the lines: While an arsonist's match, downed power line or another ignition source might have been the spark for these blazes, the changing climate and ongoing heat wave acted as accelerants — ensuring that the fires would be an extreme event that would stand out even in a region prone to wildfires. Greece, like many other countries, is having one of its hottest years on record in 2018, according to NOAA. In addition, the country has been experiencing an extended heat wave in July, along with France, the U.K., Scandinavia and even Siberia. Unusual wildfires have lit up the lands of the midnight sun above the Arctic Circle. How it works: Climate science studies show that as the world warms in response to human emissions of greenhouse gases, such as carbon dioxide, heat waves and wildfires are becoming more likely and severe. This is already happening in the American West, where a clear trend toward sizzling heat waves and larger wildfires and a longer fire season has been detected. The Mediterranean's climate is changing as well, making larger, more dangerous fires more likely. In the Mediterranean, climate change is making summers hotter and drier. In 2017, that combo led to disastrous fires in Spain and Portugal, but this year, it's been Greece's turn to experience the worst of the damage. The temperature at Athens International Airport hit 100 degrees Fahrenheit on Monday afternoon, and relative humidity levels were extremely low as wind speeds increased on Monday night. What we're watching: One study, published last year in the journal Nature Scientific Reports, found that the Mediterranean region is one of the most sensitive areas to see heatwaves spike in intensity and duration, as climate change continues. For example, if global temperatures increase by just 1.5 °C (2.7 °F) compared to preindustrial levels — an amount considered to be far too optimistic based on current emissions — then typical Mediterranean heat waves would still see their maximum temperatures jump by at least twice that amount, the study found. At 5 °C (9 °F) of warming, countries like Greece could see heat waves in which the peak temperatures are 9 °C (16.2 °F) higher than they are now, the study found.